Gutters, regardless of material or style, serve the same purpose—they drain your roof by collecting rainwater and directing them to the ground through downspouts. As their names imply, residential gutters are installed on residential properties while commercial gutters are used in commercial buildings. A basic difference between these gutters lies in the way buildings or properties are classified by their municipalities. Unlike residential houses, commercial buildings are covered by more rules and regulations that affect the installation or function of gutters. For instance, some local codes may require the gutters to be made from certain materials or of a certain size. Local rules may also specify how rainwater is discharged to avoid creating hygiene or cleanliness issues or prevent overwhelming the sewer and eventually affecting other establishments around the area. The local requirements for your building size should be known by your commercial gutter company, including other regulations applicable in the area. Gutters come in different sizes and styles. The more popular styles are the K-style and the box gutters. 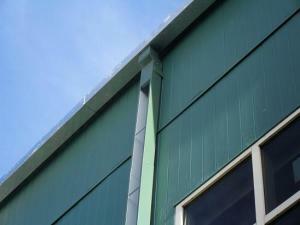 Box gutters, which can hold more water than the K-style of similar size, have wide commercial applications. The shape provides more protection for commercial buildings with larger roof area. 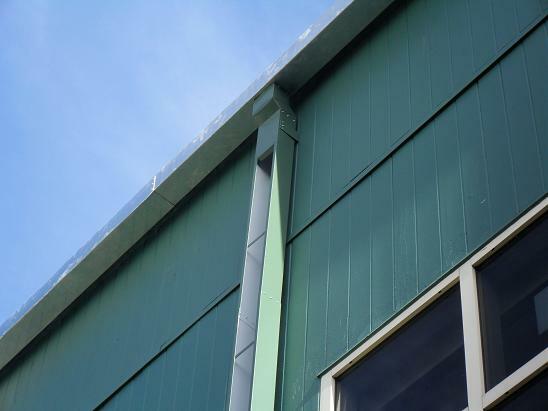 A drawback of a box gutter is its tendency to collect debris, although this problem is mitigated because commercial buildings do not usually have tall trees above them. The most common sizes for gutters are the five-inch width and the six-inch width. Residential houses usually have five-inch size gutters while commercial buildings, with a greater volume of water to handle, require the larger six-inch size gutters. Both commercial and residential gutters are made from the same kinds of materials, which are normally galvanized steel or aluminum. Some residential houses use vinyl and copper as materials for their gutters, which is rarer for commercial buildings. Vinyl is reasonably-priced and a first choice among homeowners with tight budget. Copper gutters, on the other hand, are preferred more for their aesthetic value than function. Despite being treated differently by local laws, commercial and residential gutters function exactly alike. Both are designed to carry runoff water, melted ice or snow from the roof to the sewage system and away from the building’s foundation to avoid damaging it. Gutters San Antonio Choices: Metal or Plastic Type?